The bank's former boss is reportedly considering a bid for its African assets. 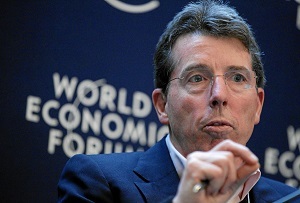 Bob Diamond’s departure from Barclays wasn’t exactly on good terms. He fell on his sword back in 2012 amid growing pressure from the City regulator and the Bank of England after Barclays was forced to pay a record £290m fine for manipulating the Libor rate. But Barclays Bob’s back, baby. According to the FT, the American is tapping up investors in the hope of mounting a takeover bid for some of his former employer’s African operations. The bank has a long history in Africa but confirmed on Tuesday that it is planning to exit the continent to focus on its core markets. It’s great timing for Diamond, who has spent much of the time since his departure focusing on Africa with his new venture Atlas Mara. He launched the firm just over two years ago with the British entrepreneur Ashish Thakkar, with plans to invest in the continent’s banking industry. It’s a challenging place to do business (‘You need balls of steel to invest in Africa,’ Aberdeen Asset Management’s Martin Gilbert told MT) but the rewards could be great. There’s plenty of room for growth (just 34% of sub-saharan African adults had a bank account in 2014) and a bank that manages to hoover up even a small slice of the continent’s one billion plus people as customers could be quids in. Difficult is the right word. With a market cap around £230m Atlas Mara is a relative Minnow, which is why Diamond is having to sound out investors, apparently in the Gulf States. It seems his plan is to after the older elements of Barclays Africa rather than Absa, the large South African bank it acquired in 2005. The new regime at Barclays won't exactly be rolling out the red carpet, but if he can convince someone to pick up the tab then he might have a shot.